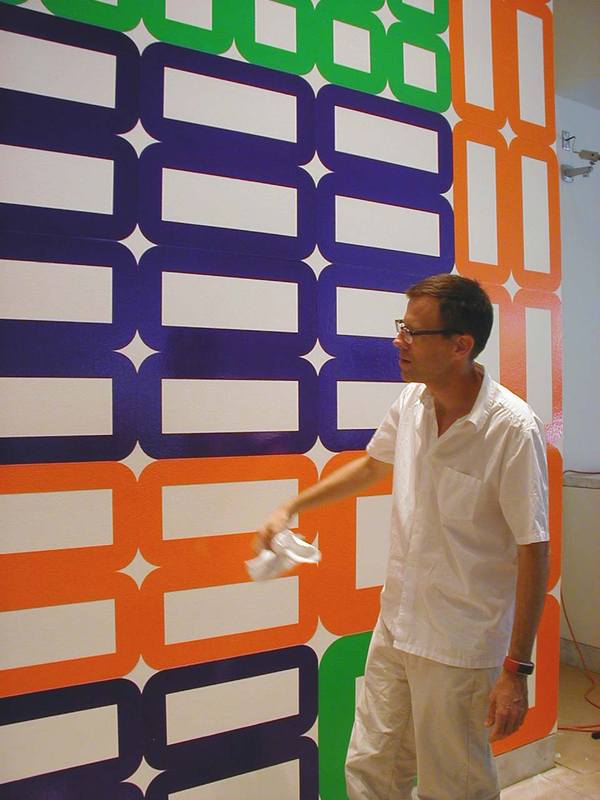 Critic Dave Hickey describes artist Jim Isermann as "a California artist with Bauhaus tendencies, Minimalist agendas, and formalist precedents in the Abstract Classicism of John McLaughlin and Frederick Hammersley." 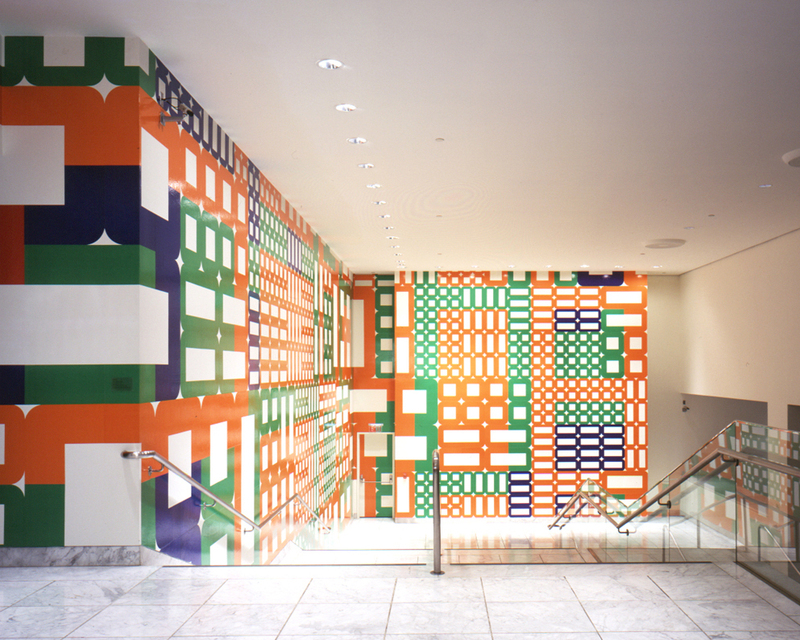 Using a multicolored assortment of vinyl decals in complex geometric patters, Isermann has created a mural along the Hammer Museum's lobby staircase. Isermann's vibrant, algorithmic arrangement of adhesive tiles marries the populist reach of handcrafted kitsch with the dramatic architectural impact of large-scale public murals. Jim Isermann was born in 1955 in Kenosha, Wisconsin, and lives and works in Palm Springs, California. Recently he has had solo exhibitions at Corvi-Mora, London (2002); Richard Telles Fine Art, Los Angeles (2001); Feature, New York (2001); the RISD Museum, Providence (2000); Portikus, Frankfurt, Germany (2000); Camden Art Centre, London (1999); and Magasin Centre National d'Art Contemporain, Grenoble, France (1999). 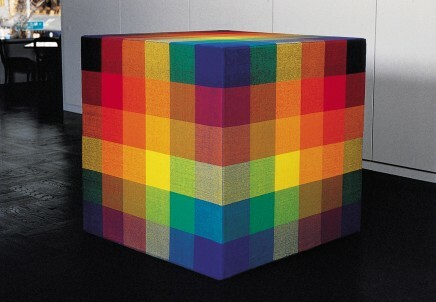 In 1998 the survey Fifteen: Jim Isermann was organized by David Pagel for the Institute of Visual Arts, University of Wisconsin, Milwaukee. Isermann has also participated in group exhibitions, including Crisp at the Marianne Boesky Gallery, New York; Patterns at Kunsthallen Brandts Klædefabrik, Denmark; The Magic Hour: Art and Las Vegas at the Neue Galerie, Graz, Austria; and Beau Monde: Toward a Redeemed Cosmopolitanism, Site Santa Fe, Fourth International Biennial Exhibition, New Mexico. 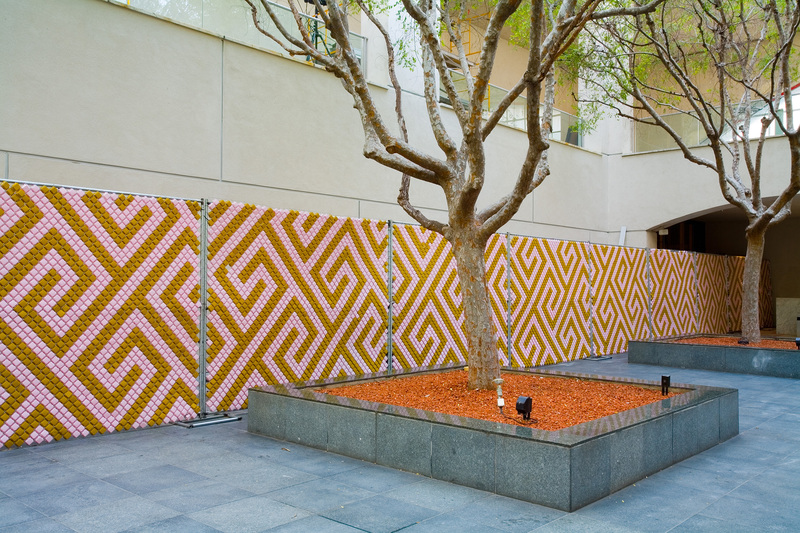 Jim Isermann has designed a temporary fence surrounding the Museum's Billy Wilder Theater construction site. 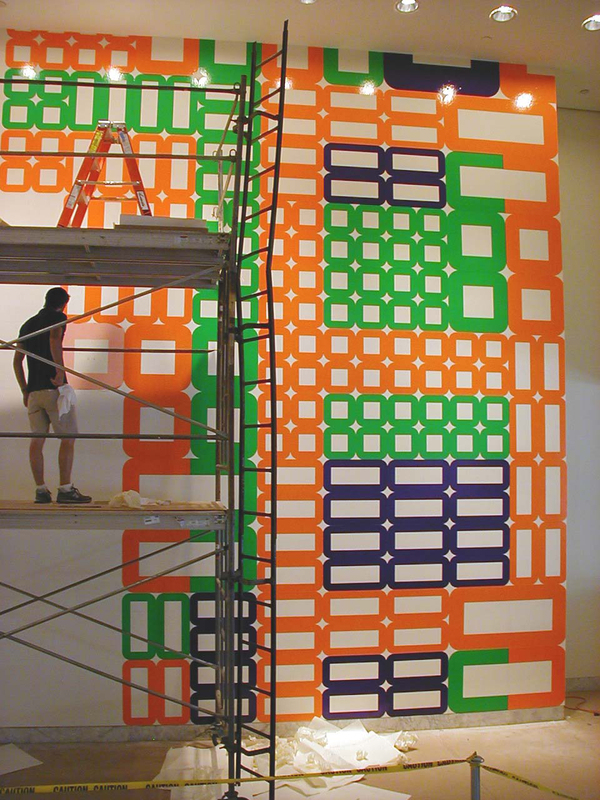 The design, which uses 40,000 Put-in-Cups, is based on the traditional Greek key pattern and resonates with the formal geometry of the Hammer Museum architecture employed by Edward Larrabee Barnes. Put-In-Cups are diamond shaped plastic cups designed to lock into chain link fence. In The Philosophy of Andy Warhol, Warhol confides in us his hope that someday he might be able to hire a boss. Andy's desire is worth citing here because, like Warhol (and quite unlike Jim Isermann), most of the artists who blur the boundaries between art and design do so because they too would like a boss. They like the rule-bound environment in which things are designed, the discipline of oversight, the specificity of the assigned task, the rigor of budgets, and the complexities of collaboration. For these artists, in D. H. Lawrence's phrase, the music of freedom is the rattle of chains. For Jim Isermann, freedom is no such thing. When you ask him why he considers himself an artist who exploits the language of design rather than a designer who works in art venues, he will tell you quite frankly that he doesn't work for anyone, that he makes his own rules and does what he thinks needs doing. Artists, of course, have been saying this for centuries-that they know better and can do better-that they can make a better painting or a better sculpture. Jim Isermann, however, is an artist/designer in the tradition of Giulio Romano and Andrea Palladio. He thinks he can make everything better-that he can make the world better by improving the quality of its objects and surfaces and make the world even better than that by improving it more succinctly, efficiently, and economically than anyone else. These are the disciplines Isermann accepts in lieu of a boss: simplicity, elegance, industry, and economy. Adhering to these principles, he begins most of his projects straightforwardly: with a primary modular unit derived from the vast repertoire of modern design and with a minimal palette of industrial color. For walls and floors, he elaborates these elements through a set of simple algorithmic permutations to generate a pattern of maximum interest and complexity. He applies this pattern to the walls or the floors as they exist using the most economical and efficient means available. In situations where a more ornate surface is required, labor-intensive craft is applied instead of costly materials. The achieved consequences of Isermann's methodology are invariably ebullient-wide-screen panoplies of saturated color and heady invention that, far from repudiating the rigor of their creation, are invested by that rigor with a cool seriousness about the occasions of human happiness. This, in Isermann's aesthetic, is quite enough. The world can be redeemed and made more joyful in explicable ways through work and thought-and should be-without mystification, waste, or inordinate expense. In practice, Isermann holds to this shade-tree utopianism with a self-assurance bordering on arrogance. He regards any resort to expensive material, "tasteful arrangement," elaborate technology, or architectural intervention as a last resort bordering on moral failure-as a crutch for artists less talented, industrious, and conceptually sound. This, of course, is only to say that Isermann is an artist and not a decorator, but that is worth remembering. He may traffic in supergraphics and hot pink motel furniture, but Jim Isermann is, first and foremost, a California artist with Bauhaus tendencies, Minimalist agendas, and formalist precedents in the Abstract Classicism of John McLaughlin and Frederick Hammersley. He is also a knowledgeable authority on the field in which he practices. Whatever there is to know about the migration and repatriation of idioms between the domains of high art and popular design in the twentieth century, Jim Isermann knows, and this, in truth, makes him a bit of a sacred monster, at once the scholar/authority on what he does and the auteur who does it-at once the ornithologist and the bird. Unlike other sacred monsters, however, Isermann is always monstrous in the service of joy. His knowledgeable arrogance is always mitigated by the egalitarian generosity of his meticulous oeuvre. The darker attributes of utopian design-its dictatorial narcissism, its intellectual pretension, and imperial grandiosity-are nowhere present in Isermann's work. This, I suspect, is because Isermann's utopian optimism is less a belief in the promise of a better future than a belief in the promise of optimism and the social benefits of utopian art. In this sense, Isermann's utopianism is essentially domestic, less sanguine about the future than nostalgic for optimism itself as an attribute of quotidian equanimity and domestic decor. As a consequence, when he evokes the ludic, culturally acquisitive, irrevocably artificial atmosphere of postwar American design, he is not reminding us that this optimism was misguided in its expectation of a better future. He is reminding us that optimism, misguided or not, makes the present better. More specifically, since he is actually creating designs and not commenting on the present by showing us pictures of absent designs, he is also making our present better. Jim Isermann's utopia is local, domestic, personal, and right now. It is where we live, if we chose to live there, and for Isermann, the primary signifier of utopian conditions-of generosity and democracy-is the openhearted commerce of idioms and ideas between high art and popular design. The primal site of this mutual migration, for Isermann, is the 1950s in America, when the streamlined biomorphism of Arp and Miró suddenly began proliferating on rec-room countertops and beer coasters, when the smooth iconography of revolutionary Constructivism began manifesting itself, as if by magic, in sleek, mass-produced capitalist icons, and young beaux-artistes, Op and Pop and Minimalist, began borrowing these idioms back in aid of new and even more insouciant agendas. What Isermann has done throughout his career is to perpetuate this tradition of migration and appropriation, adapting the formal idioms of beaux-arts practice from the 1960s-of artists like Bridget Riley, Donald Judd, and John McLaughlin-to the needs of contemporary design. What makes Isermann's endeavor art and not design is that he is, for the moment, the only one doing it. He is working on his own authority against the prevailing logic of institutional wisdom, so his work proposes itself to us as an "as if" and a "why not." Prevailing wisdom in the art world holds that "history" stopped around 1968 and that, as a consequence, the centuries-old, accumulative, acquisitive, transformative flow of stylistic appropriation and formal invention ceased in that moment. This discourse was purportedly replaced by a vertically administered, neo-Victorian discourse of narrative pictures and moral critique that is self-consciously and ideologically isolated from the province of commercial design. Jim Isermann's work simultaneously proposes and demonstrates that this may not be the case, or needn't be. It reminds us that even though "history" may well have stopped and the future evanesced, utopian optimism requires neither. Optimism is an attribute of the present that requires no more than a confirming iconography. If such an iconography exists, utopia is now. Why not? Dave Hickey is a freelance writer of fiction and cultural criticism. He lives in Las Vegas, Nevada. 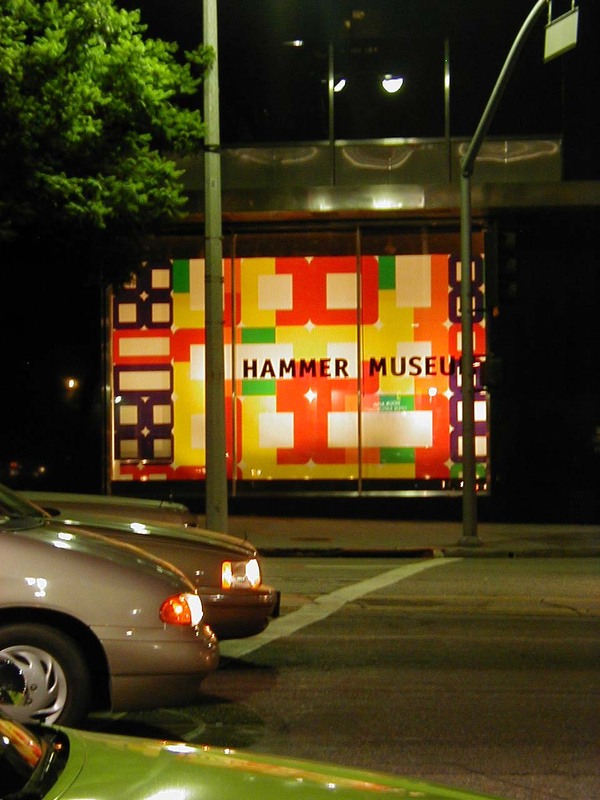 Hammer Projects are made possible, in part, with support from the Horace W. Goldsmith Foundation and The Andy Warhol Foundation for the Visual Arts. Additional support has been provided by the Los Angeles County Art Commission.